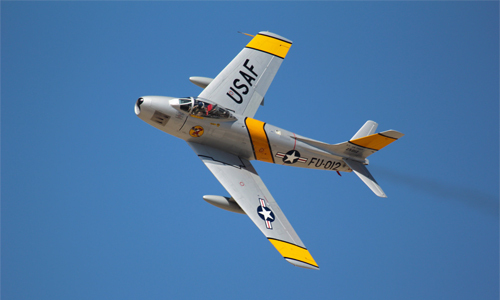 [by Earl Blacklock] In November of 1951, Captain John Paladino was a fighter pilot, flying an F-86 Sabre jet fighter over North Korea. He was flying home from an air attack on enemy railroads when the unthinkable happened. At 32,000 feet, Captain Paladino’s oxygen equipment failed, and he passed out, unconscious. “The first I knew I was in trouble was when the instruments went hazy. That’s all I remember”, Paladino recalled. Flying with the stricken pilot were friends Jack Miller and Wood McArthur. They watched with concern as they saw Paladino take a sharp drop to the left. After dropping a few thousand feet, Paladino’s plane went through the sound barrier, then suddenly pitched up into a climb. The two pilots desperately tried to come up with a plan. They at first thought of having one pilot get in front of Paladino’s jet to create a jet blast which they hoped would rouse him. But they swiftly rejected that idea, fearing the maneuver might put Paladino’s plane into a spin from which he wouldn’t recover. Finally, they decided on a risky maneuver. Positioning themselves to the left and right of Paladino’s jet, they flew just under each of his wings. They knew that by doing so, they would reduce the lift on his plane, and they hoped to ease him down to an altitude at which he would regain consciousness. But they had to get down to the right altitude in time for Paladino to revive. Their first attempt was a failure. Miller reported, “Just as we got into position, John fell off into a steep turn toward Woody.” The pilots raced to catch up, and twice attempted to get in the right position. Each time, Paladino’s plane rolled over. Finally, he began to straighten out. Carefully, Miller and McArthur kept Paladino’s plane from going into a spin, the air under his wings forming the only cushion between them. They flew like this for 100 tense miles. At 15,000 feet, Paladino’s head started nodding. They radioed him to switch his oxygen output to 100 percent. Still only semi-conscious, Paladino twisted the oxygen control, but got it only halfway before giving up. They continued to descend until, at about 13,000 feet, Paladino was getting enough oxygen to come to. He radioed that he was all right and ready to land. He was able to land successfully, none the worse for his adventure. Previous PostCan we change the past through God?